Massage and essential oils are a great combination! However, everyone is different; so which massage essential oils are safe if you’re pregnant, nursing, or are massaging an infant? JoAnn Lewis is the Director at Family Massage Education Center and she’s not only a massage therapist but an educator as well. I was able to interview her on massage essential oils that will help you bond with your loved ones through the power of touch and scent! Since this month we’re focusing on heart health, you’re going to see the physical and emotional benefits of massage, especially when it’s integrated with safe essential oils. Enjoy the interview! Tell us about your background and your practice. Since 1995, I’ve been a Licensed Massage Therapist, and I also went on to become a Master Massage Therapist in the State of Oregon. In addition to a full-time massage therapy practice, I’ve been blessed to teach in the massage field and train public and professionals alike since 1997. Growing up with a garden rich in plant oils, my parents used many flower and plant oils. In massage therapy training, I took many courses in aromatherapy and I went on to utilize essential oils in my massage practice and classes! I have taught thousands of parents to massage their babies and hundreds of educators to teach parents how to massage their babies. I teach home massage classes for the public with weekly classes at my Family Massage Center in Ashland, Oregon; Couples/Singles, Pregnant Partners and Parent-Baby massage. I also travel throughout the world, teaching certification and professional trainings on infant and pregnancy massage. You teach people how to massage their loved ones. How do people benefit from these classes? Most people have told us that the bonding, closeness, and love are the main benefits of learning to massage one another. We feel there is the richness of improved relationships certainly and many physical benefits of reduced pain, inflammation, lower blood pressure, calmness and control over one’s health, too. The nerves are soothed by massage so they can build healthier, stronger muscles, skin, brain power and bones. Massage can reduce weight and calm emotional eating by stimulating good food absorption, hormones, and balance. What do you recommend to your students about using essential oils when massaging? I advise students to do a small test patch for skin reactions and to dilute essential oils with a carrier, plant-based, preferably organic, cold-pressed massage oil. 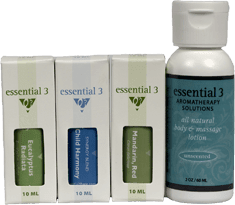 Otherwise, Essential 3’s website and Aromatherapy Solutions book are excellent guides for uses of all massage essential oils and blends. What essential oils recommendations do you have when massaging infants? With infants under the age of one, I recommend with the International Association of Infant Massage that they are massaged by parents with unscented oils to bond with the parents’ scent; a key element in the bonding process in the first year. Unless an infant is ill and then, depending on the condition, low levels of lavender could be used by scent only. Even after the age of one, a baby’s more delicate skin requires testing to use any essential oil. What essential oils recommendations do you have during pregnancy, labor, and postnatal massage? During pregnancy, dilution is important, so use a maximum of 2-5 drops per 50ml of massage oil of no more than 3 oils or use in a spray bottle of water or a room air diffuser. During pregnancy, these are the essential oils I recommend: Lavender (low level), geranium, cypress (low level), chamomile, ginger, grapefruit, lemon, mandarin, orange, or pine. For a Labor Essential Oil Blend, I recommend 3 drops per 50ml of massage oil of clary sage, rose, and/or ylang-ylang. For a Postnatal massage use oils as for pregnancy and/or bergamot (antidepressant), frankincense and myrrh (skin aid), neroli, patchouli, sandalwood, clary sage, rose, ylang-ylang. Be careful to avoid breast area if breastfeeding your baby and handle oils with care so you don’t inadvertently pass them on to your baby. Any suggestions for massage practitioners in the use of essential oils in their practice? Study, study, study and ask, ask, ask clients/patients before using essential oils on them, Also, educate, educate, educate them on how to continue using oils at home. We have four guidelines in all our home massage classes that I follow with my clients, too. They are: Ask, Listen, Trust and Praise, so we know we have served that person’s needs well with a clear, communication circle. How did you connect with Caryn and Essential Three? 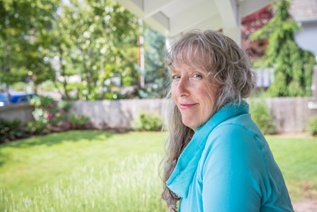 Caryn has been teaching Aromatherapy classes at our Family Massage Center since 2010 and we love her products and bountiful knowledge she shares so well for everyone! When I found her and Essential 3 products, I was so grateful for the medicinal, high-grade quality and to be able to support local sources with Caryn’s great care and dedication! Thanks JoAnn, for sharing such great information on massage essential oils — especially your recommendations on safe essential oils for babies and during pregnancy. 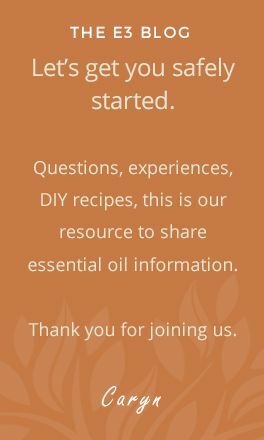 Getting educated about essential oil safety is something we’re passionate about! Visit the Education section of our website for all the resources available to you. If you’re a massage therapist we have resources for implementing essential oils into your practice as well. As always, we have our staff of clinical aromatherapists available to answer any of your questions.